← We offer Full Service Jewelry Repair on site! Throughout this month, I will be featuring different diamond rings that we carry, since this month’s birthstone is the diamond. 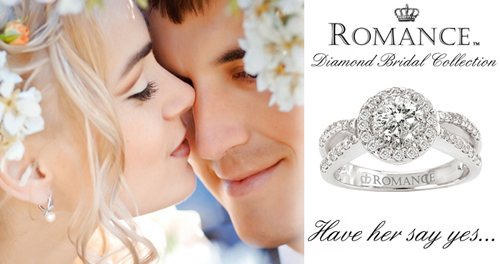 Today’s feature is Romance Diamond Bridal. “The Romance Story… with decades of design experience, our Romance artisans create elegant and timeless designs that will span generations. Our remarkably detailed pieces are hand crafted in our own facility to ensure the quality and beauty of every ring. We stand behind each ring with a lifetime warranty against defects in material and workmanship, so you can trust that your beautiful investment will endure the test of time. Celebrate your timeless love with the perfect engagement ring from the Romance Diamond Bridal Collection. Our Romance designers pay relentless attention to every detail to ensure the beauty and quality of every diamond masterpiece. We are so confident of our quality, that we stand behind every Romance ring with a lifetime warranty. Nothing surpasses the beauty of a Romance diamond ring… except for the bride who wears it. Thinking about an engagement ring? Any pieces from the Romance Bridal Collection, would make a perfect choice! Click here to look at our collection of Romance Bridal Rings! This entry was posted in Jewelry Brands, Wedding Rings and tagged diamond ring, diamond rings, diamonds, jewelry warehouse, romance. Bookmark the permalink.